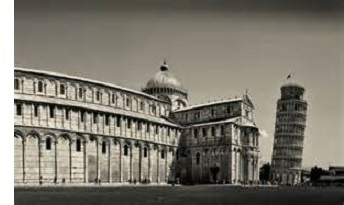 Tower of Pisa - The Tower of Pisa is more commonly known today was the Leaning Tower of Pisa because of its famous tilt. It is simply the bell tower for the much larger cathedral (seen in the picture) located in the Tuscan city of Pisa in Central Italy. Begun in the late 12th century, it took almost 200 years to complete. Due to the weak foundation upon which it is built, it started sinking into the ground only about five years after construction began. Over the centuries the leaning continued to get worse and the tower was in danger of falling over until it was stabilized in modern times. It could have been restored to an upright position, but because the tilt has become its trademark, that was never a consideration. The eight story tower stands 183 ft (56 m) high. Prior to its correction, it leaned at an angle of 5½ degrees, but now stands at about a 4 degree angle. No one knows for sure who designed the Tower of Pisa, but recent evidence suggests it may have been an architect named Diotisalvi.